Having your asphalt pavement sealcoated is one of the most cost-effective ways to protect your investment. Sealcoating improves the appearance of your asphalt surface, but it also protects your pavement to help ensure that it achieves the long life that it should attain. 1. Sealcoating reduces damages caused by ultraviolet radiation. You have probably seen ads for sunscreens that discuss using products to block UV rays to prevent premature aging. Ultraviolet radiation can also affect how your asphalt ages. Exposure to the sun can fade asphalt from a rich black to a washed-out gray, making the pavement less appealing. UV rays can also cause the asphalt to become overly dry, leading to premature deterioration. 2. Sealcoating creates a barrier against automotive fluids. Sooner or later, any pavement on which vehicles drive or park will encounter a car that leaks oil, transmission fluid, coolant, gasoline or brake fluid. These corrosive chemicals can soften asphalt, making it impossible for the pavement to bear the weight of traffic without crumbling or cracking. Sealcoating helps keep chemical spills from penetrating to the asphalt. 3. Sealcoating increases the flexibility of asphalt pavement. One of the secrets to the longevity of asphalt pavement is its flexibility. When subjected to weight, asphalt “gives” just enough to absorb the stress and spring back. 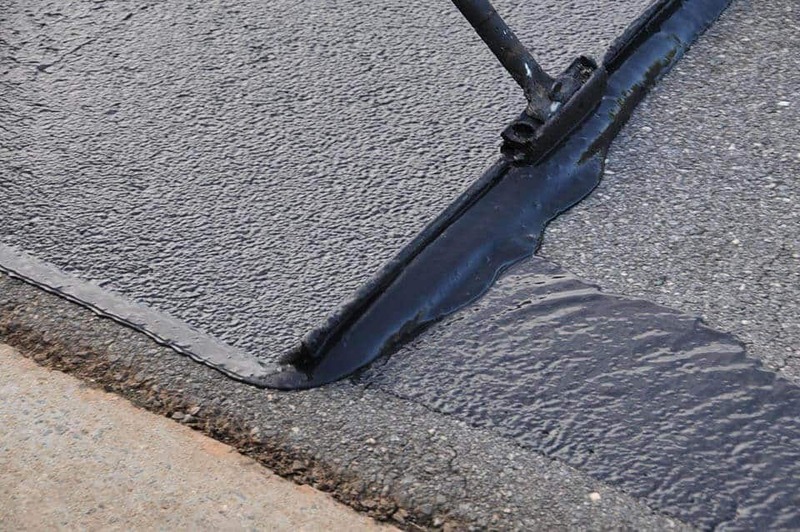 Without sealcoating, asphalt can become dry and brittle. Brittle asphalt is far more likely to crack or crumble. Sealcoating helps asphalt retain the flexibility it needs to withstand the loads placed upon it. 4. Sealcoating makes it easier to maintain and clean the pavement. The smooth barrier provided by sealcoating offers less resistance when sweeping or power washing the pavement, so superior results can be obtained with less effort. Sealcoating also accelerates the time it takes ice and snow to melt, which makes the pavement safer for your visitors. This reduces the dangers of damage to your asphalt from water penetration as well. Sealcoating can help you achieve the best return on your asphalt investment. If you make repairs (such as having cracks filled) on a timely basis and have sealcoating applied regularly, your pavement should have a lifespan that spans the decades. Asphalt Pavement Solutions has been sealcoating our customers’ asphalt surfaces since 1983. We offer maintenance programs to help you keep your pavement in top condition, new pavement installation, parking lot striping, asphalt repair and more throughout Pennsylvania, New Jersey, Delaware and Maryland. You can use our online form to request a free quote, or call us at 1.856.461.1710 or 1.800.559.SEAL.